No QWERTY keyboard, no SurePress clickable screen gimmickry, the BlackBerry Torch 9860 is taking the plunge. Not the first time that RIM are venturing into touchscreen but they're past the point of no return with this one. The BlackBerry Torch 9860 will walk among deadly droids and iPhones - probably the most hostile of environments in smartphone land. No wonder RIM are extra cautious. They had a couple of scouts in touchscreen territory that didn't return. The Storm phones were exposed despite their SurePress disguise. Now, this time RIM are not beating the drum. Their first real touch-only phone doesn't seem to warrant its own name. It's simply a regular team member. A keyboardless model in the Torch lineup. We bet any of the Storms would kill to be in its place rather than a footnote in BlackBerry history. A history heading towards tablets, history in which the likes of the Torch 9860 will be playing an increasingly greater role. 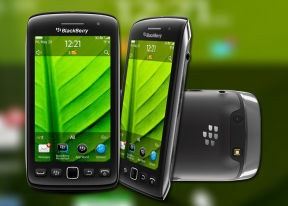 BlackBerry's latest OS 7 and the real-deal touchscreen experience will help the Torch 9860 find a niche of its own. Not that BlackBerry purists will ever get over the lack of a physical keyboard, but the Torch 9860 is not looking at them. Instead, it has plenty to offer to long-term BlackBerry users with a taste for experiment. The Torch 9860 is part of a new generation of 1.2GHz-powered phones running the latest OS 7. It promises a new touchscreen experience and better specs across the board. In case you wonder though about QWERTY in the list of cons - it felt right to sound a warning to traditional BlackBerry users. It's too radical a change. So, the Torch 9860 will have a massive point to prove. You can take the QWERTY out of a messenger but never the messenger out of a BlackBerry. Coming up next is our pros and cons list, so let's get down to business. The Torch 9860 has all the makings of a fine smartphone, down to the very price tag. That last one is no joke. RIM have always charged a premium on their phones. Nowhere to run if you need their service. It's the latest generation however that's finally becoming relevant in the outside world. More and better features, and refined user experience, RIM are keen to catch up with the standard-setters. It won't happen overnight and the Torch 9860 probably won't live to see it. But it won't be sorry for not trying. The BlackBerry Torch 9860 needs not be ashamed of not running Android or any other best-selling OS. It's part of a new wave of RIM hopefuls that demonstrate the company's confidence to take a new direction. Success is built on trust, and RIM of all companies should know that. They are trying to appear credible to a whole new set of users. If nothing else, interesting times ahead for the BlackBerry Torch 9860. Let's hope it's not a curse. i hope it supports Viber app. it's my 1st BlackBerry phone. hope it can play videos through youtube and other sites. thanks.